Spanish poet; flourished at Soria in the beginning of the fourteenth century. The name has been wrongly transcribed as Androtil, Adrutil, Ardothiel. Steinschneider connects the name with Ardot; the ending "ial" having either a relative or a diminutive significance. 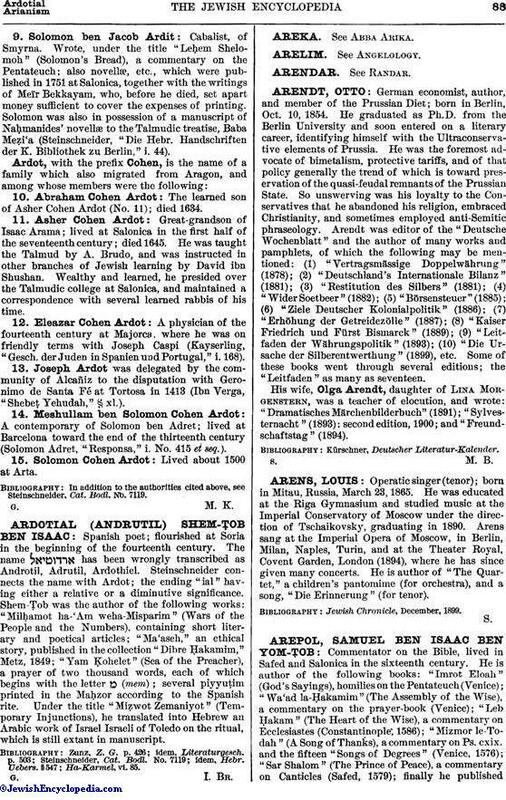 Shem-Ṭob was the author of the following works: "MilḦamot ha-'Am weha-Misparim" (Wars of the People and the Numbers), containing short literary and poetical articles; "Ma'aseh," an ethical story, published in the collection "Dibre Ḥakamim," Metz, 1849; "Yam Ḳohelet" (Sea of the Preacher), a prayer of two thousand words, each of which begins with the letter מ (mem); several piyyuṭim printed in the MaḦzor according to the Spanish rite. Under the title "Miẓwot Zemaniyot" (Temporary Injunctions), he translated into Hebrew an Arabic work of Israel Israeli of Toledo on the ritual, which is still extant in manuscript.